IZALCO, El Salvador , Mar 5 2015 (IPS) - Nearly three years after the rights of El Salvador’s indigenous people were recognised in the constitution, there are still no public policies and laws to translate that historic achievement into reality. In June 2014 the single-chamber legislature ratified a constitutional reform passed in April 2012 which acknowledged new rights of native peoples in this Central American nation. But the leaders of indigenous communities and organisations told IPS they were worried it would all remain on paper. “There have been changes full of good intentions, but the good intentions need a little orientation,” Betty Pérez, the head of the Salvadoran National Indigenous Coordinating Council (CCNIS), told Tierramérica. These cover a wide range of areas, such as respect for indigenous peoples’ medicinal practices and their collective rights to land. And according to lawmakers of different stripes, the constitutional amendment pays a historic debt to the country’s native people and helps pull them out of the invisibility to which they had been condemned. The CCNIS is pressing for the country to ratify the International Labour Organisation’s (ILO) Convention 169 concerning Indigenous and Tribal Peoples in Independent Countries. But no date has been set for the legislature to ratify the legal instrument, which protects indigenous rights. Pérez spoke with IPS during the commemoration of the 1932 indigenous uprising, held in this municipality of 74,000 people 65 km west of San Salvador, which was the epicentre of the revolt. The rebellion in Izalco, demanding better conditions for native people, was brutally repressed by the dictatorship of Maximiliano Martínez (1931-1944), leaving between 30,000 and 40,000 dead. El Salvador’s indigenous people were ignored and invisible for decades, under the argument that after the massacre, they blended in with the ‘mestiza’ or mixed-race population, abandoning their languages and traditional dress, to avoid persecution under successive military regimes, which accused them of being communists. For that reason there is little documentation or up-to-date figures on their socioeconomic circumstances in this impoverished country of 6.3 million people. According to the Perfil de los Pueblos Indígenas de El Salvador, a report on the country’s indigenous people available only in Spanish and jointly produced by the World Bank, the Salvadoran government and indigenous organisations, approximately 10 percent of the country’s population is Amerindian, divided into three major groups: the Nahua/Pipil in the centre and west of the country; the Lenca in the east; and the Cacaopera in the north. The study, published in 2003, reports that most of the country’s native people depend on subsistence agriculture on leased land, while others work as hired rural labour. A large number of communities also make and sell traditional crafts. Native organisations and experts say that implementing or applying the constitutional amendment requires the adoption of an integral policy with an inclusive focus and respect for the world vision of each native group, in education, health, environment, labour, community development, and land titling. The health system, for example, must have an “intercultural” focus making it possible for native people to receive adequate health services that are respectful of their culture, said a 2013 report by then United Nations Special Rapporteur on the Rights of Indigenous Peoples James Anaya, who visited the country in 2012. That kind of focus would make it possible to recognise traditional practices such as the healing carried out by 88-year-old Rosalío Turush in Izalco – known as Itzalku in the Náhuat language. The elderly native healer learned to use herbs from her ancestors, and to ease pain with massage in the case of broken bones or sprains. “Now people mainly come for me to give them a massage to relieve a pulled muscle, a broken bone, because I’ve still got the touch,” she added. In order to put the constitutional reform into practice, “secondary laws” to regulate the new rights must be passed. But almost no progress in this direction has been made in the legislature. “If the reform does not establish mechanisms to give it life, if the legislators do not approve the necessary secondary laws, it’s going to be left as dead letter in the constitution,” said Supreme Court Justice Florentín Meléndez during the commemoration of the massacre here in Izalco. Meléndez also referred to the touchy issue of indigenous communities’ access to collective land ownership – which was already in the constitution but was never regulated to put it into practice. “Communal property is already recognised, the only thing that is needed is for the lawmakers to continue moving towards concrete fulfillment of those rights, not just on paper but in real life,” he added. In the late 19th century, the communal land of the country’s indigenous peoples was taken from them by coffee plantation owners. The landowners turned tens of thousands of indigenous people and peasant farmers into casual labourers who lived in the most abject poverty on the coffee plantations, sowing the seed of social discontent which, decades later, was one of the causes of the 1980-1992 civil war that left 80,000 people – mainly civilians – dead. The 1932 uprising also protested the theft of indigenous land. 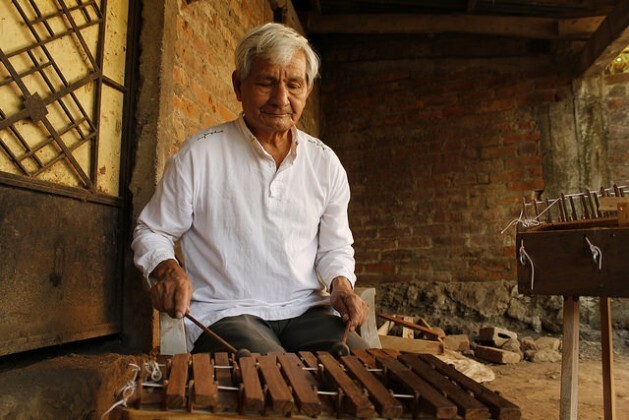 “That’s where the 1932 massacre came from, because the landowners, if someone didn’t sell them their land, stole it at gunpoint,” Tito Kilizapa, a 74-year-old indigenous craftsman and musician from Izalpo, told Tierramérica. Pérez, with the CCNIS, pointed out that the constitutional reform was delayed for a decade because of opposition from powerful economic groups, which feared the expropriation of communal land taken from indigenous communities in the 19th century, or other measures that would hurt their own interests. These groups are also trying to block the approval of the secondary laws needed to implement the constitutional amendment, especially with respect to indigenous access to land. “We are immersed in a capitalist system, we have groups of power…there are economic and political elements that keep the government from carrying out these processes of change,” Pérez said.